The RECARO Style “Sportline” offers the following additional equipment to the “Trendline”; a combined electrical height and tilt adjustment and the RECARO Airmatic lumbar system – for sporty driving with comfort and ergonomics. 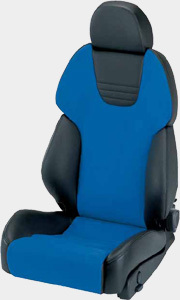 RECARO's “Sportline” XL style is also available for very tall drivers. Handwheel for backrest adjustment on both sides. Electric height adjustment with interated tilt adjustment: correct body angle, the best possible angle of vision; touch control switch element.